Quite a while ago I read Entreleadership by Dave Ramsey talking about the four quadrants of our life. They are originally from the book by Stephen Covey, The 7 Habits of Highly Effective People, but I loved how Dave explained them. So I wrote them down, determined to live in quadrants 1 and 2. Then put it away and promptly forgot about it. 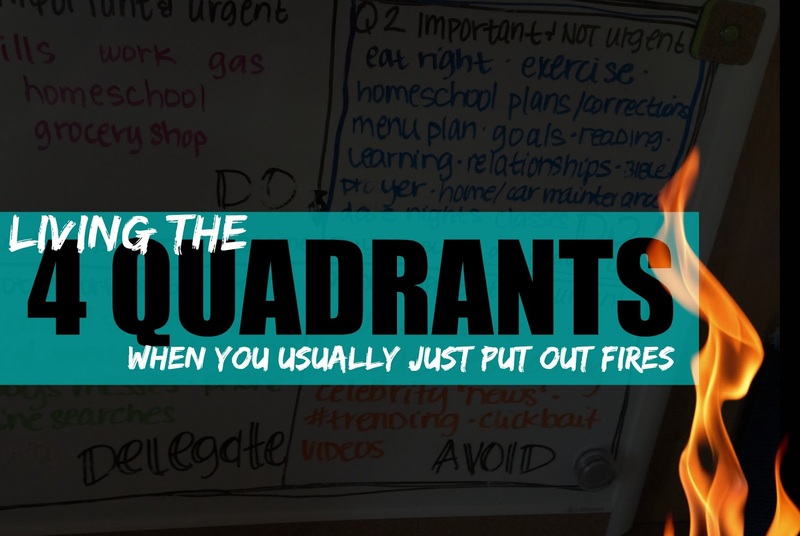 But after living the life of a firefighter, and last minute urgency, I wrote them out again, this time where they'd be right in my face, because I'm usually living in quadrants 3 and 4 by default. And I'm so SICK of default! So here's how it's going to look in my life this week. I'm going to complete quadrant 1 items, the urgent and important, ASAP each day (homeschool, gas for the car, pay the bills, and buy groceries). My goal is to get Q1 items done before noon each day. I'm going to try to live most of my day in quadrant 2. This is the stuff I want to do and need to do and if I don't do, they'll gradually move over to quadrant 1. Stuff like homeschool corrections, making a menu plan, reviewing my goals, reading good books, and good eating and exercising. The only way I can live in Q2 is to delegate and/or avoid quadrant 3 items and completely avoid quadrant 4. Quandrant 3 items are things like pointless arguments with the boys (avoid), checking email like a crazy woman (and then not responding to it... I can only check it if I actually have time to respond! ), cleaning up my teen boys messes (delegate to them), "real quick" social media check-ins (avoid), spur of the moment online searches (delegate to paper, then when I'm back on the computer if it's still important, I can look it up then). Quadrant 4 items are just stupid items that I get sucked into every. single. day. Ugh! Stuff like getting stuck in the loop on youTube, Facebook scrolling (it just never ever ends), celebrity "news" articles on news sites (really? this is news? Really? I just clicked to read this? ), #trending hashtags, click bait links (those headlines like "This woman picked up an egg carton and my jaw dropped when she did this".) I HATE this quadrant and HATE that I waste SO. MUCH. TIME. HERE! So that's what I'm trying to get back to. Living in Quadrants 1 and 2 are so much more fulfilling, so much more productive, and require real discipline and effort. Quadrants 3 and 4 are default, deception, and lies! What are the Quad 3 and 4 items you get sucked into? What do you want to do in your Quads 1 and 2? I'd love to hear! *any links given are affiliate links that help support this blog. I SO hear you! It's so frustrating! I think your quadrant 4 activities are things many, many of us find ourselves hung in. Just a quick moment to check this or that easily runs into 1/2 an hour of nothingness. I love your idea of making quadrant 1 goals a before-noon priority. It sounds like a great plan, and I'm going to give some thought to the things that need to be in my quadrant 1. BTW, I'm working through your Ephesians study (definitely a quadrant 1), and am being so blessed! Thank you for putting together such great studies!